An 11 year old girl recently received the gift of home mobility thanks to Englewood, Colorado, based company Accessible Systems. Kyla Bursiek, who lives in Boulder Creek, Colorado, has been suffering from cerebral palsy since her birth at just 24 weeks gestation. Kyla uses a wheelchair or walker to move, but she is very active and loves doing adaptive gymnastics, swimming and skiing. 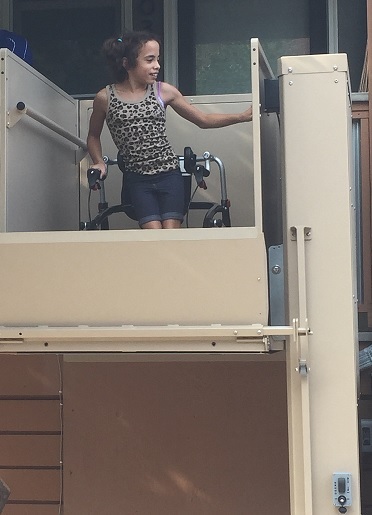 The Home Builders Foundation (HBF) recently introduced the Accessible Systems vertical platform lift (VPL) to Kyla and her family. The plan of Home Builders Foundation, which partnered with Boulder Creek Builders, was to help make home life easier for Kyla. This called for the modification of Kyla's bathroom and the addition of new railings that could provide for easier access within her home. While the bathroom and railings were an improvement, Kyla still needed independent access into and out of her home. The best option was the installation of a Vertical Platform Lift, or wheelchair lift, which is like a small elevator that can lift a rider and his or her wheelchair up to 14 feet. “We were proud to be a part of the effort to help Kyla and allow her more mobility and independence,” said Nathan Colburn, President of Accessible Systems. “It was heartwarming to see the community come together to assist Kyla to be able to enter and leave her home by herself. Becoming an adult requires independence, and now Kyla can achieve independence more easily. Kyla’s first words after riding the lift for the first time were, ‘Can I do that again?’ Bringing freedom and independence into the homes of those with disabilities is our mission at Accessible Systems, and this is a great example of the community and our experience coming together to make a life-changing difference." Accessible Systems provides accessibility equipment and installations to create customized environments for homes and businesses. The company offers the following product lines: stair lifts, ceiling lifts, wheelchair lifts, handicap bathrooms, residential elevators, specialized medical equipment, and remodeling services that include barrier free bathrooms, grab bars, door widening, ramps and other installations. Accessible Systems is licensed and insured and ICBO certified, as well as a SureHands© distributor, Medicaid HCBS, Worker’s Compensation and Vocational Rehab provider. For more information about the products and services offered by Accessible Systems, visit www.accessiblemed.com. To hear Kyla’s story, visit https://www.youtube.com/watch?v=n1SfExfkLGg&feature=youtu.be.